North Carolina Central University in Durham was the first state-supported liberal arts college for African American students in North Carolina. It was chartered as a private institution in 1909 and opened its doors to students in July 1910. 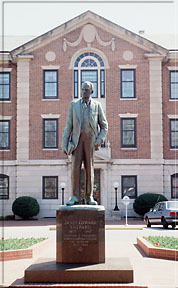 Its founder, James E. Shepard, served as its first president. In the beginning the college was known as the National Religious Training School and Chautauqua. Its purpose was the development of young African American men and women into citizens with fine character and sound academic training. In 1915 the school was sold and reorganized as the National Training School. During this period Mrs. Russell Sage, a wealthy New York philanthropist, was a generous contributor to the school. In 1923 the General Assembly appropriated funds for the purchase and maintenance of the school, making it a publicly supported institution that operated as the Durham State Normal School. Two years later the legislature again renamed the college, and it became the North Carolina College for Negroes. Its mission was to offer African American youth of the region a liberal arts education and prepare graduates to become future teachers and principals of secondary schools. The school graduated its first class as a four-year college in 1929 as a result of the sincere interest of Governor Angus W. McLean, generous gifts from Durham industrialist and philanthropist Benjamin N. Duke, and contributions from Durham citizens. In 1930 state appropriations made it possible for the school to expand its physical plant and improve its educational facilities. By 1939 the General Assembly authorized the establishment of graduate work in liberal arts and the professions. The School of Law began operation in 1940, and the School of Library Science was created in 1941. Because of this growth and expansion, the legislature changed the name of the institution to North Carolina College at Durham. In 1969 the legislature again changed the name of the college to reflect its new university status. In 1972 North Carolina Central University became a constituent institution of the University of North Carolina System. The university in the early 2000s enrolled nearly 6,000 students earning degrees in a wide variety of undergraduate and graduate programs on its 100-acre campus. Elizabeth J. Seay, "A History of North Carolina College for Negroes" (M.A. thesis, Duke University, 1941). NCCU contributions to NC Digital Collections: http://digital.ncdcr.gov/cdm4/results.php?CISOOP1=exact&CISOFIELD1=CISOSEARCHALL&CISOROOT=all&CISOBOX1=North+Carolina+Central+University. NC Highway Historical Marker G-53. Courtesy of NC Office of Archives and History: http://www.ncmarkers.com/Markers.aspx?sp=Markers&k=Markers&sv=G-53 (accessed November 16, 2012). Do you have a Physical Therapy Program or PTA program? I hope this helps! Please post back if you need additional help.